I'm A Shareholder KIT - Award Winning Way To Teach Kids About Stocks Market. I'm A Shareholder grabs kids' attention and keeps them involved. Extremely effective on a standalone basis, it's power as a learning tool is magnified when coupled with true ownership of a fun company. Each mailing from THEIR company becomes a learning opportunity, whether it's an Annual Report, a dividend check, or an invitation to the Shareholders meeting. 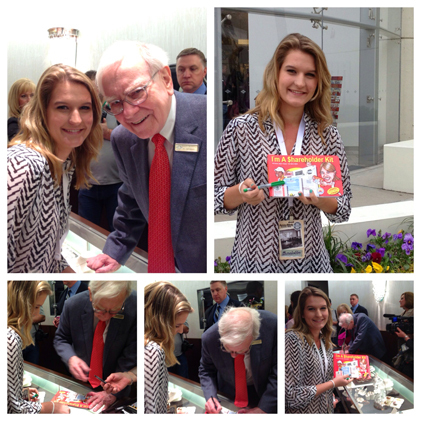 I'm A Shareholder guides the reader through the whole experience in a fun and engaging way! 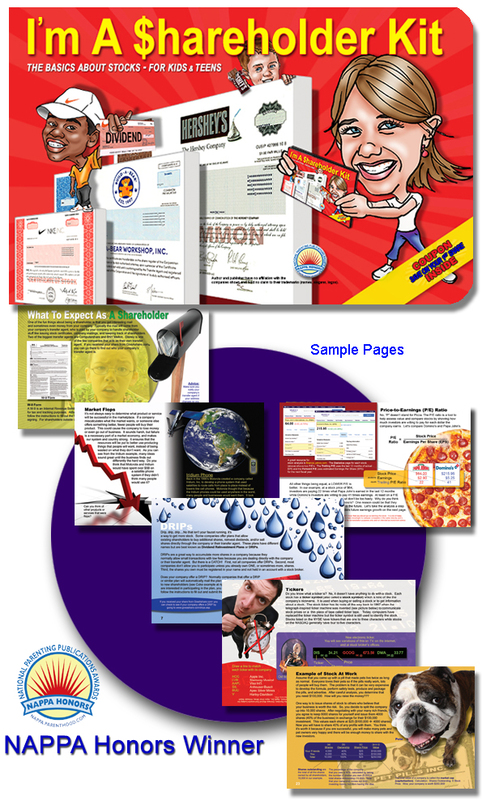 Kit includes I'm A Shareholder book, including "Information About Your Company Checklist", Discount coupon for first share, and mini-share collector card offer. Warren Buffett receiving and autographing the I'm A Shareholder Kit at the Berkshire Hathaway Shareholder Meeting in Omaha, May. Warren is a huge advocate of improving the kids financial literacy. Each shareholder of Berkshire Hathaway stock receives up to 4 passes to the Annual Shareholder Extravaganza - a huge event that attracts approximately 40,000 people from around the world for the weekend pack full of events. "My hope is that this kit, along with the experiences that come with actually owning stock, will provide the same learning that I had as a kid when my parents helped me buy my first stock - Topps Chewing Gum - the perfect choice for an avid baseball card collector and voracious gum-chewer." For kids, teens, young adults. The ONLY book/kit written to be used with a share of stock- from us or a broker. Includes a coupon for $20 OFF their 1st share of stock. See specials below. + add KIT Order a stock and add the KIT as an option. + Gift Certificate Get the KIT plus a Gift Certificate for their 1st share. $10 OFF Gift Cert (see note1). 1Cannot be combined with other coupons.